Walking up and down the streets of New York before the most highly anticipated U.S. soccer match in history, one could have mistaken this city for London, Berlin or Rio de Janeiro. Thousands of people clad in football jerseys, and not the variety of Manning, Brady, or Peterson, but those of Donovan, Altidore and Dempsey. If just for one day, the country stood still for the world’s game, and it was a truly fantastic site to behold. Having been in Europe for the 2006 World Cup, it was my first taste of just how much this game means to the rest of the world. Every car and storefront fitted with unbridled nationalism. And not a jingoistic nationalism, but a peaceful nationalism that only the world’s very best sporting tournament can conjure. Like so many others that follow the European game, and having witnessed the previous Cup amongst true fans of the game, I was weary of following the tournament here in the States, if only because I felt most would treat it as a passing interest, and not the end-all, be-all that the event represents for serious fans. I wanted to be around the electricity of Munich and Amsterdam, Liverpool and London. Little did I know I had to go no further than five blocks to get just what I craved. New York, of course, is the country’s most diverse and cosmopolitan of cities. Here, there are literally hundreds of nationalities represented and languages spoken. I knew there would be an energy come World Cup time, but I got much more than expected. Since Friday’s opener, everywhere you turn you cannot avoid people sporting their favorite players’ jerseys or national scarves. From the obvious Messi and Rooney jerseys, to the more obscure Appiah and Forlan shirts, soccer fever has truly taken hold of this town. We encountered no less than 10 pubs in the East Village turn down prospective patrons because they had exceeded capacity. Granted, this was primarily for the US-England encounter, but it was still a site to behold in this country. There are street fairs popping up in the city for the Cup, a makeshift soccer “stadium” showing all 64 matches in SoHo, and literally every single business with a liquor license and access to at least one TV is opening its doors from 7 a.m. everyday for the group stage. But the most exciting aspect of all of this was the masses’ reaction for the big one: USA-England. Fearful of ex-pat Englishmen outnumbering Americans on the streets and in the bars, it was a terrific surprise to see literally tens of thousands of people donning their American regalia. It doesn’t take much for Americans to sport their pride, we are a truly patriotic nation, a great sports nation as well. 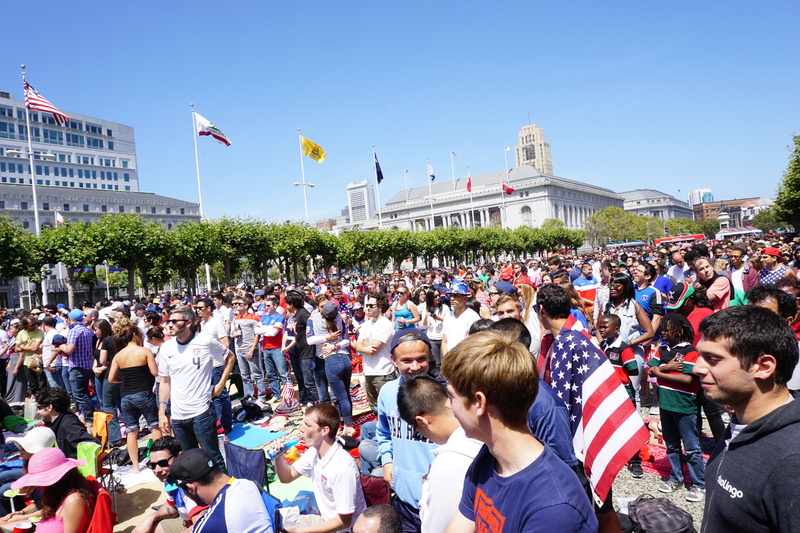 On Saturday though, everyone was a US soccer fan. Saturday was truly amazing. I was born and raised in Germany and now live in Greenville, SC not exactly a soccer enthusiastic part of the country. I decided on saturday morning to check out a new local sports bar/restaurant since it was the only one i had seen in this town that was advertising LIVE World Cup games. When i got there I was in shock. The whole place was buzzing, plenty of english men and US soccer fans. For the first time EVER I thought i had walked into a German bar for a Soccer match. The entire crowd stood up and sang the national anthem and chants of U-S-A were drowning out any English chant in the building. When the ball trickled in from Dempsey, the place went crazy..people jumping up and down, I was hugged and high fived by random people and it felt like a true Football environment. I was in total shock. I hope the US team does well because that’s what will allow the atmosphere to grow and become more and more exciting as the tournament progresses. Can’t wait for the next match. I really hope the States can make it through to the next round and to carry this enthusiasm through the tournament. There is a huge undercurrent of support for the USA in this country right now that is ready to explode. And, for the first time ever while watching a soccer game as a US fan in a sports bar, I didn’t feel like I was part of the minority. 90% of the crowd were there to support the USA. I wish I could remember the names of all the pubs but they escape me right now…perhaps because I was a tad intoxicated. Just jump around, link up with some locals if you can. Of course, might have been easier in 06 because we hadn’t just played England. But I’m sure you’ll find some friendly folks that will lead you in the right direction. Frank Lampard owns The Pig’s Ear in Chelsea, a few streets down from Stamford Bridge. I was there in December after a Chelsea match, great crowd, so I’m sure it’ll be happening for Cup matches. Thanks very much for your suggestions. I was a little worried about the timing of this trip, knowing that the US-England match would have taken place less than a week prior. But, I am more than happy to root for England (as well as the USA) during the rest of group play, so I will look to meet up with some locals, cheer my arse off for the Three Lions and try to stay out of trouble. Thanks again! Virtually every pub and bar in England is showing the England matches, don’t worry about missing it. Also, don’t worry about how the England fans (in general) will treat you. There is no anti-American feeling over the footie result. It will be appreciated if you do cheer for England by any real fans. I’m not saying there’s no chance of finding trouble but to be honest if someone is going to give you trouble they’ll want to do it anyway, for any reason – not because of the result. You might want to check out http://www.sportspubs.co.uk – you can search for bars showing the US match also. Hope you have a great trip. Well, being a texan, Soccer is an afterthought as you grow up, but starting in with the 2002 World Cup, it has been something of obsession for me. With that being said, I attended a watching party at a pub in Frisco, and the place was a madhouse, and it was 98% pro American. When Clintinho scored the place went friggin bannanas, and it felt like I was watching the superbowl. This country is making strides, and eventually soccer will replace football as the number one sport for the states. Crazy, I know, but the reports that came out this year about the long term concussion damage some pros have experienced are going to turn the public on American Football eventually. I, for one, will probably not let my son play American Football, the risk is not worh it. I’m rambling, but yesterday was truly a special day that I spent with good friends, and the USA was blessed with some good football. Hey Soccer Pants, I love the enthusiasm. I am from Texas as well (Austin), and it is a shame how many kids play it growing up just to leave it behind to play the major sports. While I don’t agree that it will ever take over American football as the predominant sport, it is so nice to see people getting behind the sport. I think the NFL is about to faced with a wake up call. American Football is way too violent, the stories of ex pros trying to answer their telephone when someone rings their doorbell(Steve Young), are alarming. Football(uk) is very physical, but for the most part the damage inflicted is not long term, the same can’t be said about American Football. It hurts me to say that America’s sport is not up to snuff, but….too violent…. What bar were you at? I was in NYC for the weekend and watched the game in East Village, truly an experience I will never forget. I was at Standings on 7th st and 2nd ave. Where were you? I had a similar experience in San Francisco. Thousands of American fans, people chanting “USA!” out their balcony windows, bars with the huge lines, and man, when Dempsey scored, the bar I was at (Danny Coyles on Haight) erupted. It was wonderful. Conn. was buzzing as well!! The Stamford Pubs had TV’s out on the sidewalks with fans everywhere! I do have a question though about the World Cup Final. Will NYC have a big screen viewing for the World Cup Final… like Boston did at Government Center in 2006? I would love to make the trip down and view the final in a large crowd of fans. I have heard rumors that Union Square will be trying to put up a large screen for viewing. Once I find out about something, I’ll post it to the site. The problem is the media in the US, you have commentators and columnist who don’t give a damn about soccer, they doesn’t soccer to become popular. The last 2 minutes of an NFL game took 30 minutes, what a joke! Come on, you can’t be shocked. It wasn’t just New York, either — As a NY native, I was expecting low turnout here in Lawrence, Kansas (small college town), and was shocked when I arrived at my local pub (where I’ve watched Champions League finals, etc.) an hour and a half before the game, only to find that they were at capacity — I was turned away at the door!! That, perhaps, would be the one drawback to footie gaining acceptance in the US — it will make finding a seat at soccer-friendly pubs a bit more of a challenge! Manhattan was great. I trained it in from my brother’s house in Ct. Many of the people on the train were in Yankees stuff, heading to their home game. But as I scanned the crowd more I realized that a decent amount of passengers were also wearing USA jerseys. We got to our spot on 25th and 3rd right around the start of the Argentina match. At the time it was empty, but they assured us that the crowd would be good for the USA match. Walking the street it was amazing how much buzz the game had created. I walked across the street and an EMT vehicle was waiting at a light, as I got near the driver side door the EMT stuck his head out the window and let out a huge “USA.” A couple of guys at the counter of the deli I went in to for breakfast mentioned that they were rooting for the USA even though they were from Mexico…..it was a great vibe and this article really touched on that. The bar ended up being about 95% American. I was kind of hoping for 70/30 just for the extra banter, but I was impressed with our enthusiasm. The place reached capacity about 45 minutes before kickoff. The bar absolutely belted the anthem and went completely bonkers after Dempsey’s goal. At the end the few England fans went around wishing us well, which I thought was classy (as we had been serenading them with similar taunts about the oil spill that the Gaffer mentioned at Wowies). All in all it was a great day. I’m heading to South Fla. next week, so maybe I will get a chance to test out the Wowies atmosphere if/when the US plays in the 2nd round. Sounds like that experience was very similar. I went to the SF Giants baseball stadium – AT&T park to watch this game on the jumbo HD screen in centerfield. Admission was free but it was only advertised a few days before in the newspaper and on the internet. Literally 20,000 people minimum showed up. The whole first and second decks were completely packed. It was freaking nuts. 20k people in a baseball stadium watching a soccer game on TV being played half way around the world. One section of American supporters was standing and chanting the whole game as if it were being played right there. The Giants missed out on a chance to make some money too b/c they didn’t open up enough concession stands… beer lines were 400-500 people long and went down the entire concourses. They completely underestimated soccer’s popularity here. I would say that you just need to call it Football and your article would be fine.